Home Crafting (all) Repurposing DIY backpack rain cover from umbrellas! DIY backpack rain cover from umbrellas! 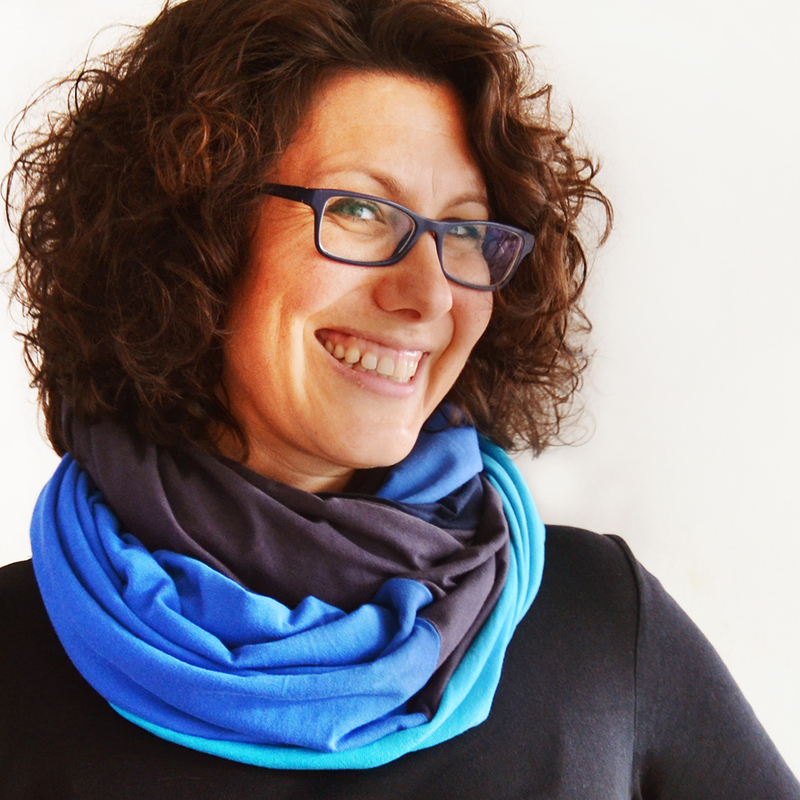 Last week, I got caught in a torrential downpour when walking my kids home from school. And even though all three of us had umbrellas and the school is about a two minute walk from our home, we got totally drenched. When we got home, we had to spread the kids’ wet books and notebooks all over the floor for them to dry. Doesn’t that always happen?! When it’s just barely sprinkling when I leave home to pick up the kids, all hell lets loose as soon as the school doors open and they come out! Geesh! Then I remembered the amazingly simple idea that I saw years ago on Green Issues by Agy for sewing an elasticized backpack cover from umbrella fabric. 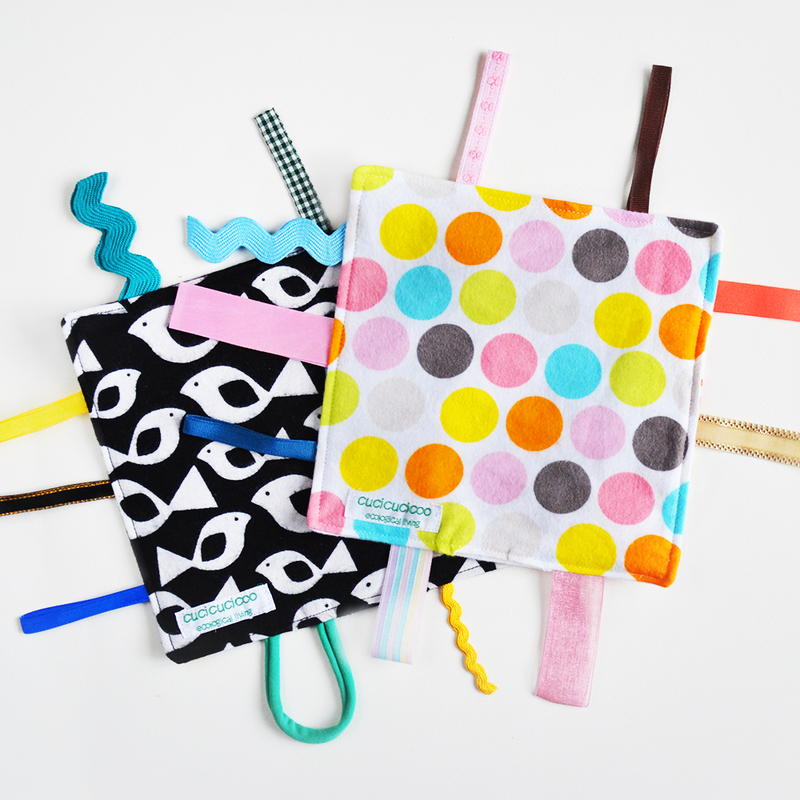 I have a massive collection of umbrella fabric from umbrellas that I find broken and abandoned on the side of the street (which I usually use to make my Carry Everywhere Shopping Bags) so I immediately got to work making these covers for both kids and a friend. 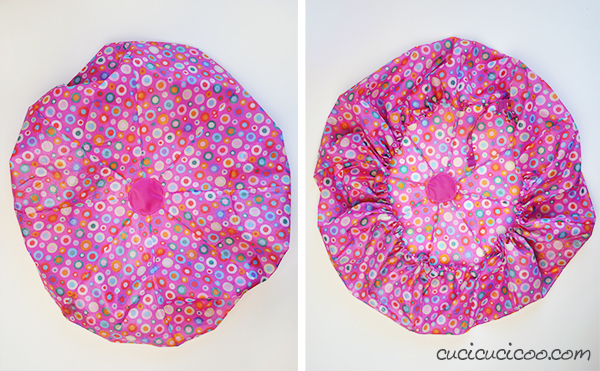 These covers are really easy to make because the umbrella fabric is already the right size and shape for covering a backpack, plus it’s super lightweight and obviously waterproof. They only take about 15-20 minutes and, because you’re repurposing something that would’ve otherwise been thrown out, you’re helping the environment and saving money! They’re perfect for kids going to school, but also for students going to university, professionals going to work, or anyone out for a walk! 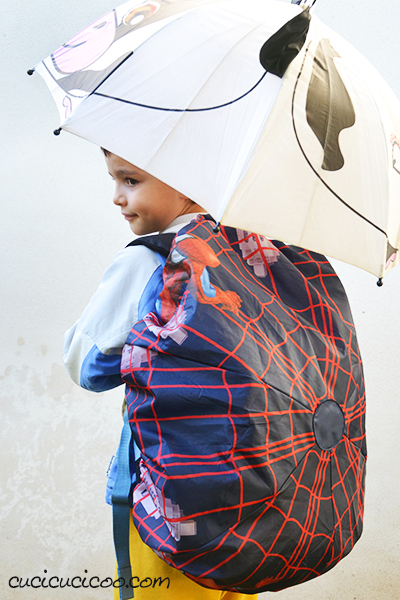 Are you ready to make a DIY backpack rain cover? Then let’s get started! When you remove the fabric from the umbrella, you’ll see that there is a hole in the center where it was attached to the umbrella pole. We’re going to patch up this hole. You can put the patch just on the outside, but I prefer patching it from the inside, too, to protect more and also to look better. 1. Pin two scraps of umbrella fabric together, right sides facing. Trace around the jar cap with a permanent marker or a pen. 2. Sew just barely inside the line of one circle (#1 above) and a bit more inside the line of the other circle (#2), leaving a small opening to turn the circles right side out. 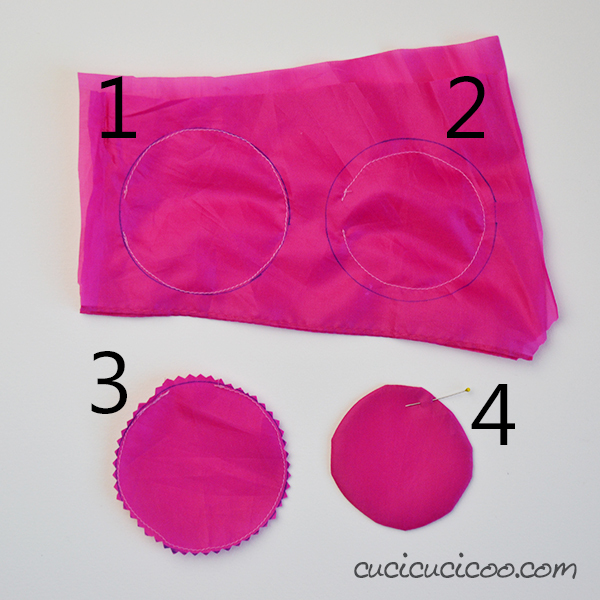 Trim all around the circles with pinking shears (#3), then turn the circles right side out and iron flat (using an ironing cloth* to avoid melting the fabric) with the edges of the opening folded inside. 3. 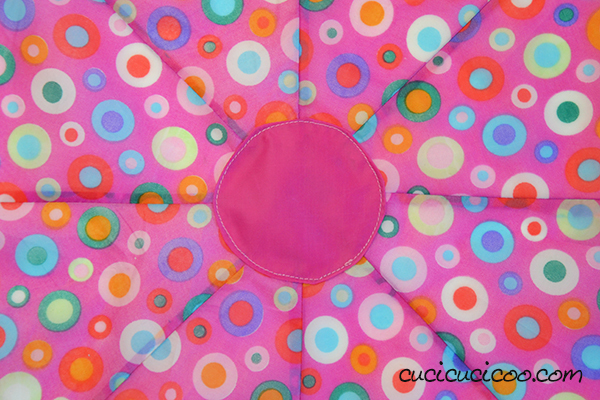 Pin the smaller circle over the center hole on the wrong side of the umbrella fabric, then sew in place. 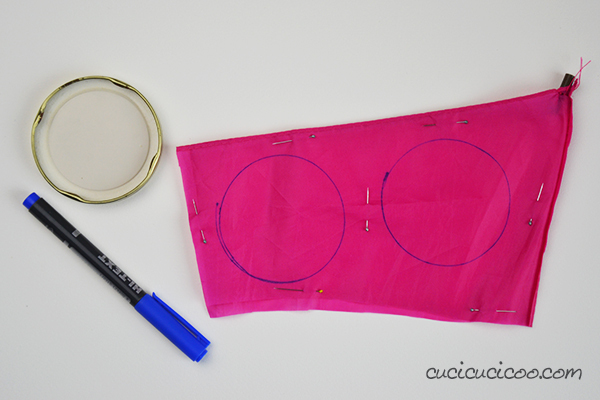 Then pin and sew the larger circle on the right side of the umbrella fabric, making sure that you cover the stitching from the first circle. 4. 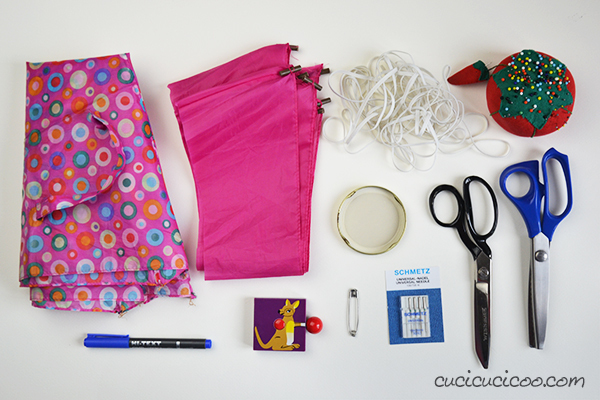 Place the backpack in the center of the umbrella fabric and fold the fabric edge over the sides of the backpack. It should reach 4-6″ (10-15 cm) over the front of the backpack. If it folds over more than that, you’ll have to trim it down. 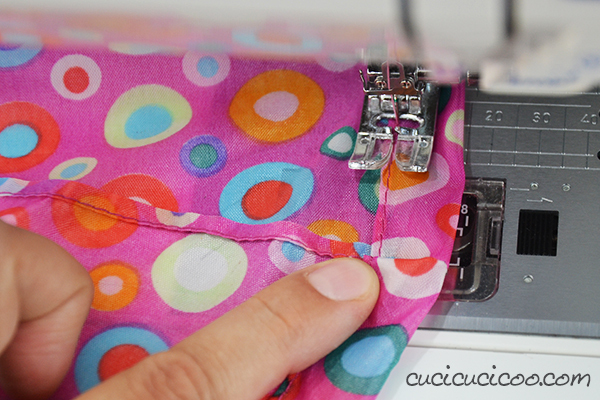 In this case, place a pin (shown above by the arrow) where the fabric needs to be cut. If your umbrella is already the right size, skip down to step 8. 5. 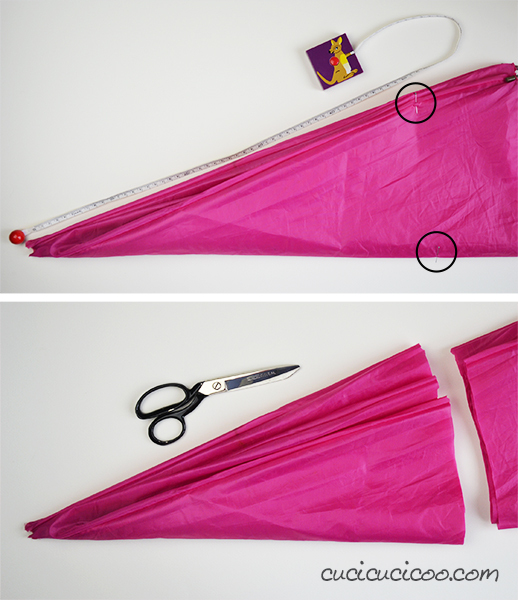 Fold the umbrella fabric in half over and over until getting a triangle shape like above. Make sure that the pin from step 4 is showing (bottom circle in the top picture). Measure from the tip of the triangle to the pin, then place a pin on the other edge of the triangle at the same distance from the tip (top circle in the top picture). 6. 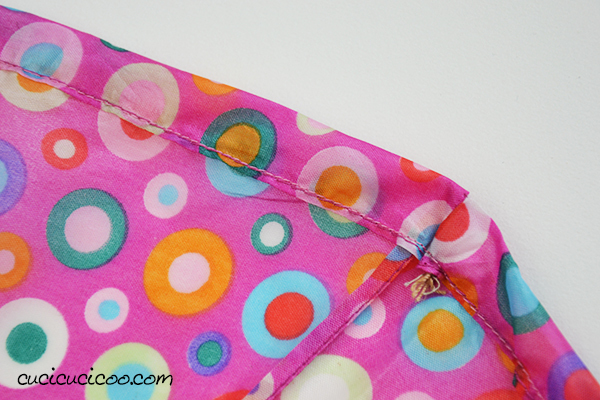 Cut a slightly curved line from one pin to the other to remove the excess fabric. Umbrella fabric frays quite a bit, so we’re going to make a very simple rolled hem. 7. 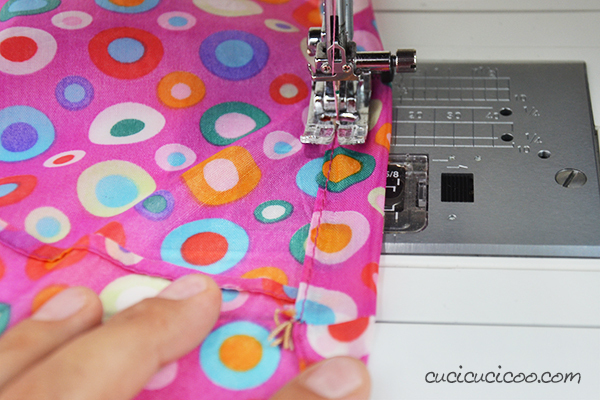 Sew around the cut edge of the umbrella fabric with a rolled hem foot. (Most sewing machines come with this foot. Check your manual on how to use it. This foot is a lifesaver when hemming very thin fabric!) 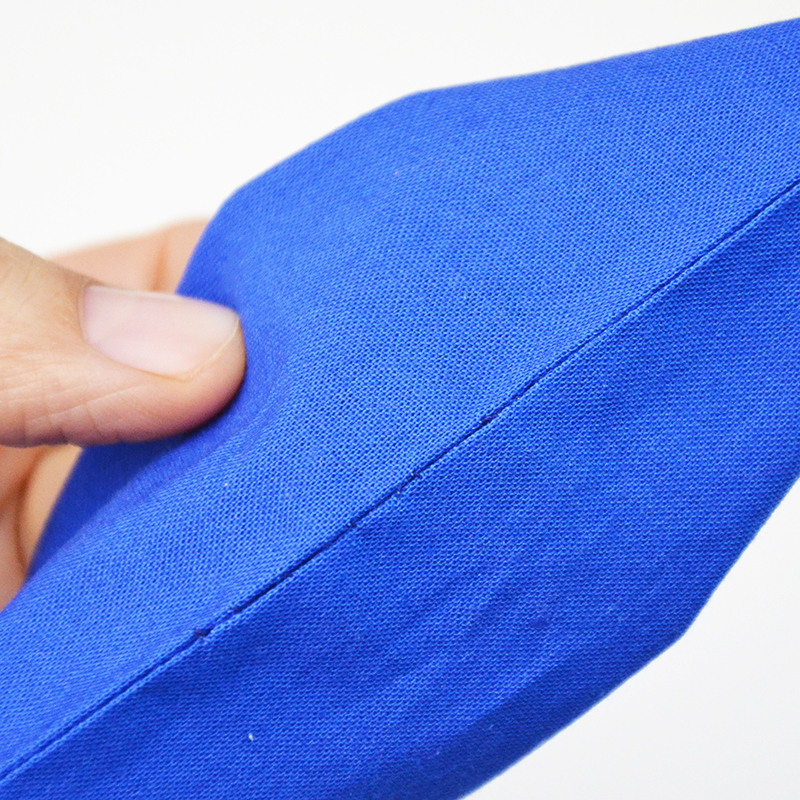 Because the edge is curved, it will probably get a little messy, but don’t worry about it, because we’ll be folding it up in the next step. 8. Put the fabric under the needle, wrong side up. 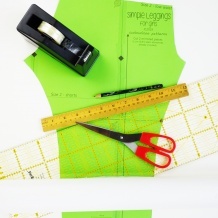 Fold the edge in about 1/2″ (1.5 cm) and sew in place. Remember to backstitch at the beginning. 9. Stop just before each point of the umbrella and fold the corner over so that the casing makes a little turn. 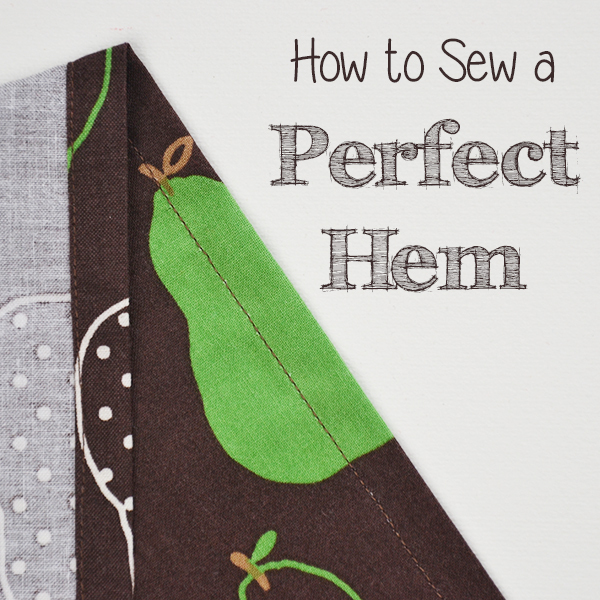 Then sew right over the folded corner. 10. Continue sewing all around the circle, backstitching shortly before the point where you started to leave a small opening. This is what the sewn points look like. 11. Measure around (vertically) the widest part of the backpack. 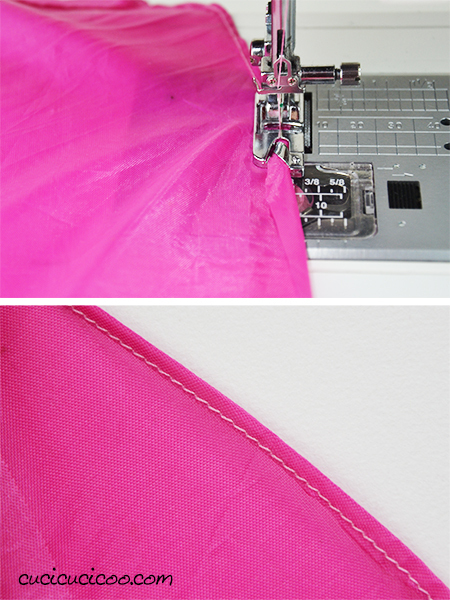 Cut a piece of elastic 4″ (10 cm) less than that measurement. For example, my daughter’s backpack was 123 cm around, so I cut the elastic 113 cm long. 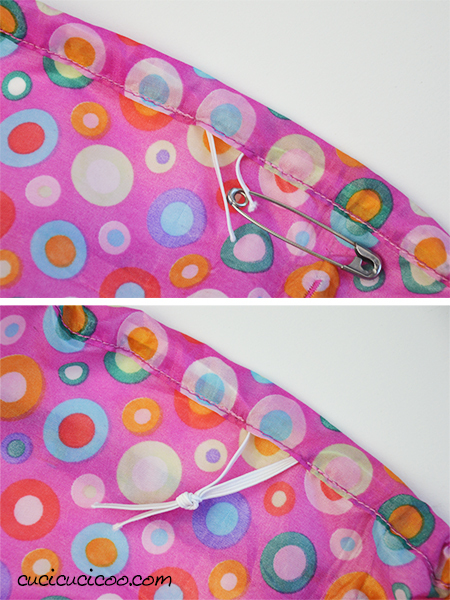 Stick a safety pin in one end and push it all the way around the casing until it comes out the other end (top). To avoid the other end getting pulled in the casing, too, I like to stick it to the edge of the casing with another safety pin (though I didn’t do it in these pictures). 12. Knot the ends of the elastic. 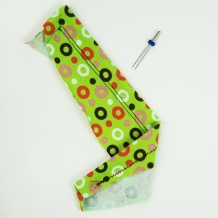 Then gently tug on the fabric edges to pull the knotted end inside the casing and sew the opening closed. Ta da! You’re done! You now have what looks like a gigantic shower cap! 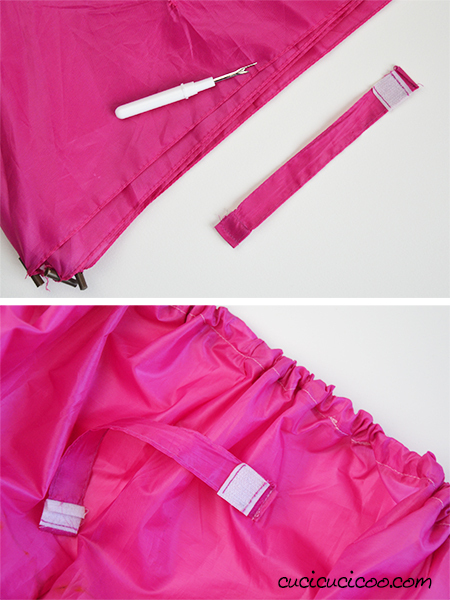 The rain cover can be folded up with the umbrella’s original closure strap, so if you had to trim your umbrella fabric and the strap was on the excess fabric, remove it with a seam ripper (top) and sew it back on to near the edge of your new rain cover (bottom). 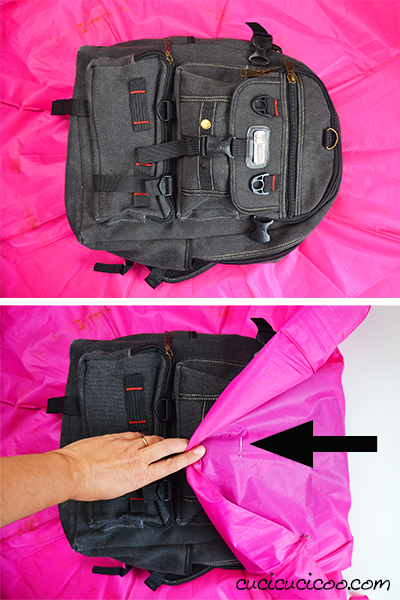 Now just slip your new DIY backpack rain cover over your bag next time you get stuck in inclement weather! 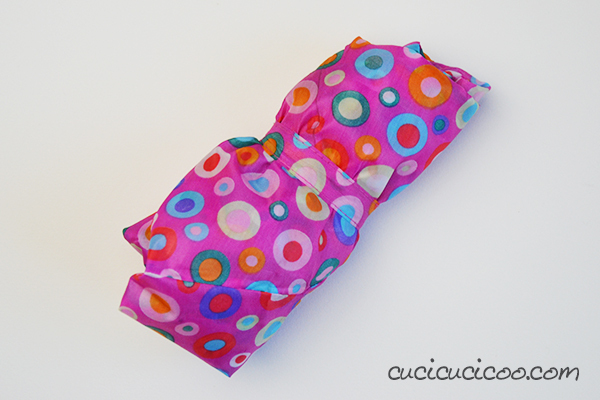 No more trying to cover both you and your bag with your umbrella! And when you don’t need it, fold it up and secure the umbrella strap around it! This makes a nice light and compact packet that you can keep in your bag so that you’re ready any time you need to protect your backpack! You can’t get much easier than that, right?! 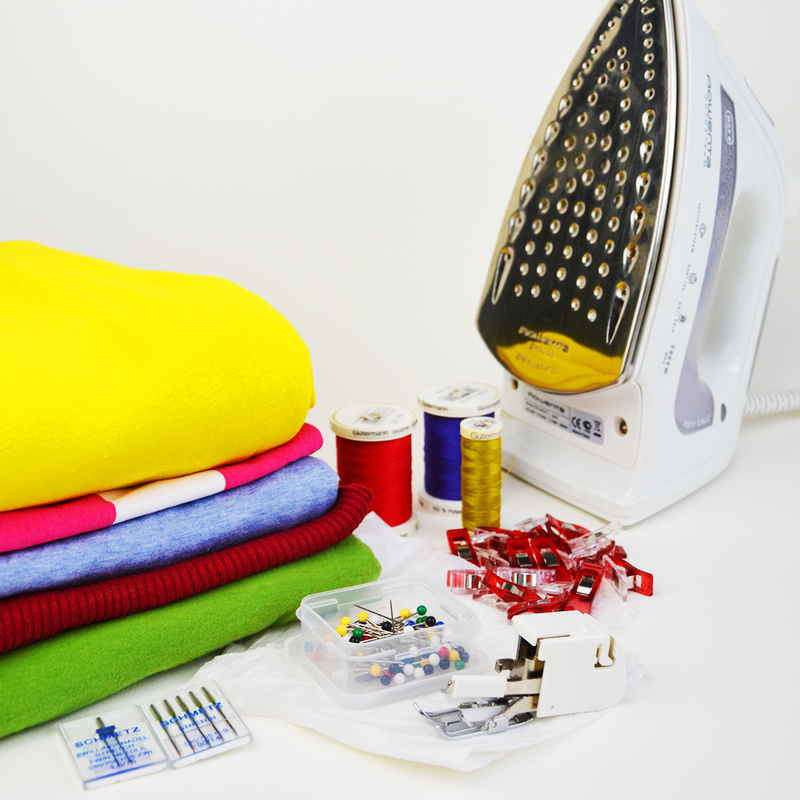 Now sew up a DIY backpack rain cover for each member of your family! 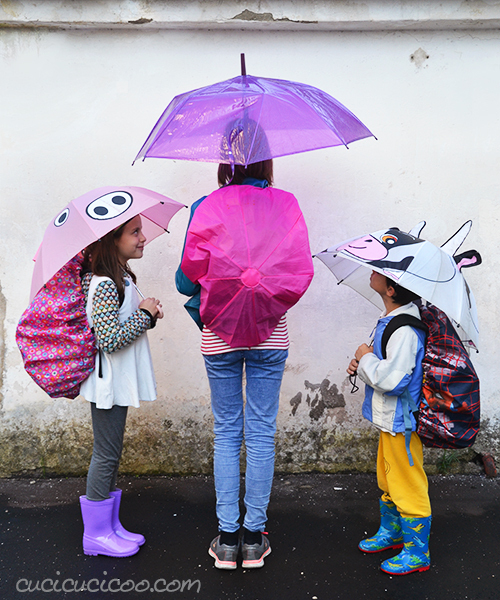 My three models all agreed that they’re almost looking forward to it raining again so that they can use them! Haha! 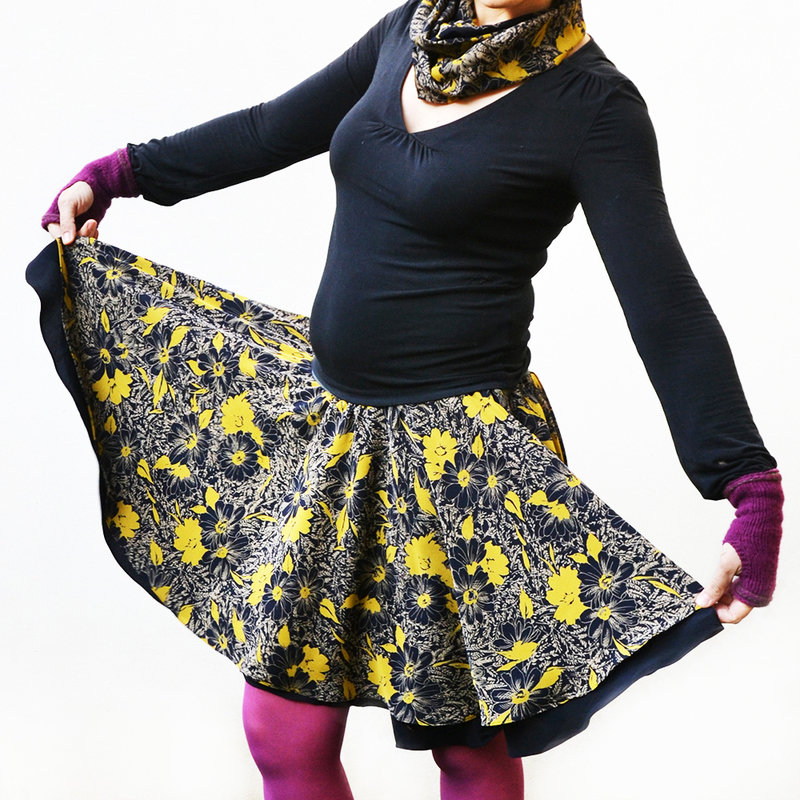 Have you gotten to love sewing with umbrella fabric? 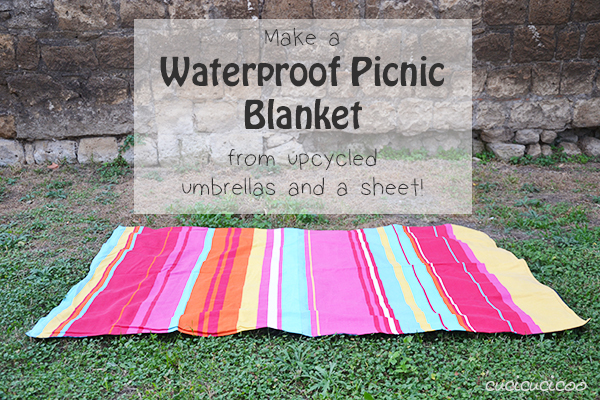 Well, then try your hand at a fantastically upcycled waterproof picnic blanket from umbrellas and a sheet or the super lightweight Carry Everywhere Shopping Bag with my FREE pattern! A very cute and smart idea, especially useful in areas where it rains a lot. I don’t know how much it rains in Greece, Mary, but here it rains a ton in the rainy season, and I’m not talking a few drops but outright downpour! Thanks for stopping in! I love your version of the bag covers and so beautifully made. Agy, I’ve been wanting to make one ever since I saw your version, and when we got drenched last week… that was the last straw and I decided to sit down then and there to make them! Thanks so much for sharing your wonderful idea on Green Issues! 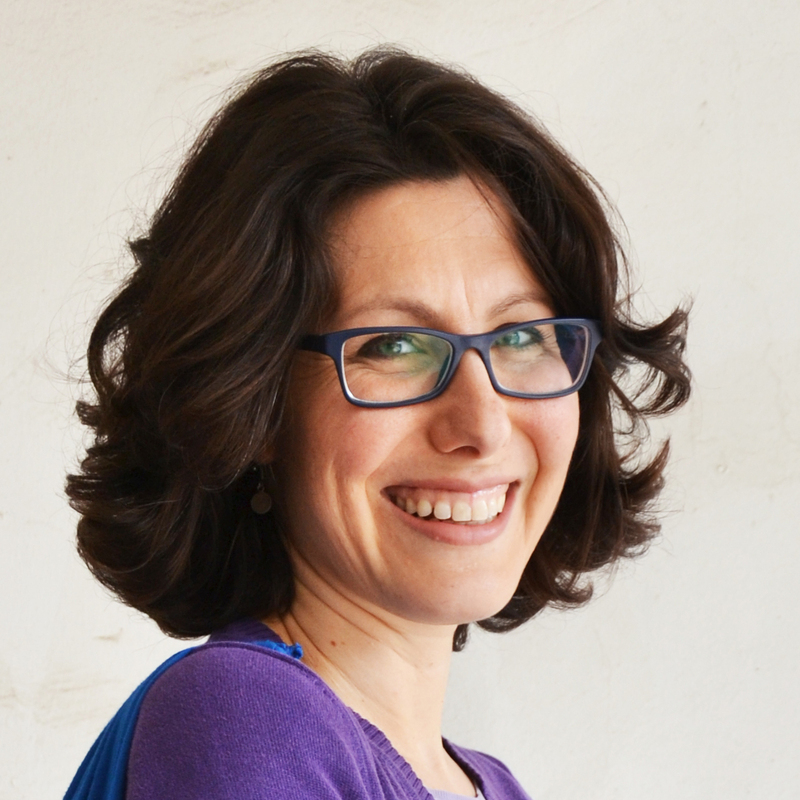 Grazie, Monica! Come ho scritto, l’idea originale non è stata mia, ma l’ho un po’ elaborata! E soprattutto utilissima! Grazie Maria! What?! Do the kids in your daughter’s school need see-through bags because of some sort of security issue? I’d never heard of that! I can imagine that even a bit of sprinkling would be a total disaster with a mesh bag! 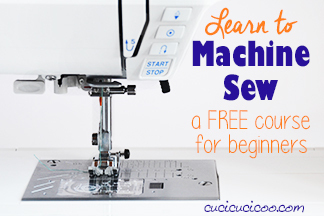 You’ve got to sew up one of these right away… they’ll save you! Thanks so much for sharing, Anne! very neat! I love them. Glad you like it! They are so practical and useful! Thanks, Antonella! They’re really so easy to make, but such a life saver! This is wonderful! I love how easy it is and finally something to re-use broken umbrellas! Love it! 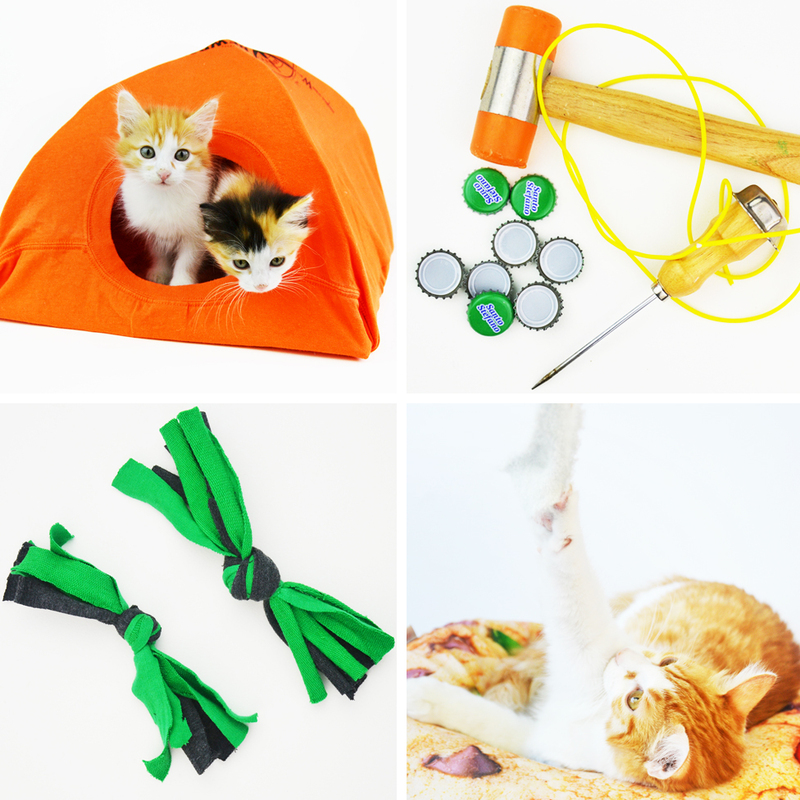 Thank you for submitting this DIY to DIY Crush! I just published it. This is such a fantastic idea! 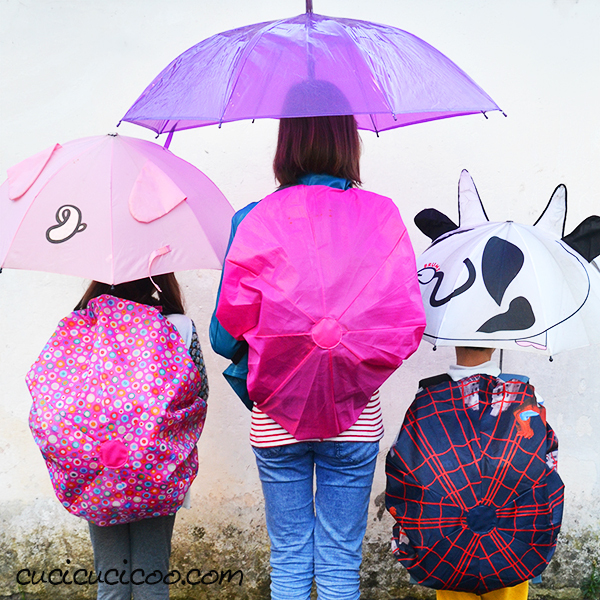 Love the backpack rain covers! Pinning to share and wanted to let you know that you will be one of our featured posts at our next Snickerdoodle Create-Bake-Make link party! Great idea, especially if you live in a rainy area. Thanks for linking up with Funtastic Friday! Yep, and where I live rainy season is VERY rainy, so it saves us! Thanks for stopping by, Heidi! Lisa, this is great so practical and clever! They now sell backpack covers but rather make my own and have been saving broken umbrella fabric and here is the perfect project for it, thanks so much! Looks great. My umbrella is bigger than my bag, so I would need to trim it. Instead of sewing with a rolled foot hem, which I dont have, could I just serge the edge? Hi Aga, Sure, serging the edges should be just fine! I also had to trim one of my umbrellas, but it didn’t occur to me to use my serger, but that probably would’ve been easier!